Ever see those nifty-looking photo collages that all the cool kids are posting on Facebook and Instagram? They’re actually pretty easy to create, and you can make them directly on your iPhone or iPad. Plenty of photo collage apps are available in the App Store, but Pic Stitch is the one I’ve been using lately. It’s simple, fast, and boasts a decent variety of photo frames. Pic Stitch for iOS boasts scores of frames for your photo collages, although not all of them are free. Best of all, it’s free, although you’ll have to tolerate some ads (including unskippable video advertisements) and a slew of in-app purchases (all optional, at least). 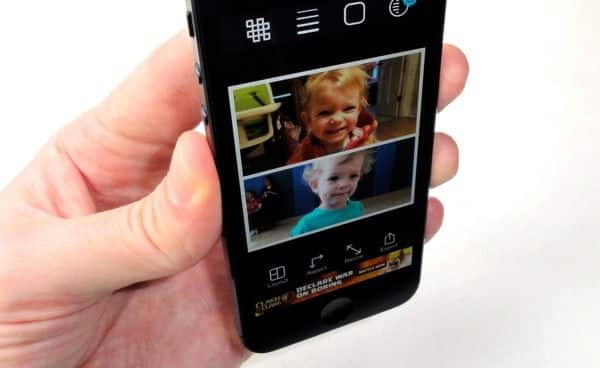 The first thing you’ll see after installing and launching the app is a swipable page of photo frames; about 60-ish free frames are available, with paid frame “packs” selling for 99 cents and up. We’ll go ahead and pick a simple frame—a two-picture version, with the photos stacked on on top of the other. Tap the top spot in the frame to add an image; you can pick a snapshot from your iPhone or iPad’s Camera Roll, one from Facebook or Dropbox, or tap Camera to snap a quick photo. You can then crop, enhance, rotate, or otherwise tweak the image with Pic Stitch’s built-in photo editor. All set? Click the blue “Done” button. Next, you’ll jump back to the main collage—and when you do, don’t be surprised if some heads are cropped out in your first image. Never fear; just tap and drag the photo until it’s framed just the way you want. Rinse and repeat for the second photo in your collage: just tap the empty frame, pick a snapshot, do a little editing, then reframe it. Now, want to change the shape of your collage? 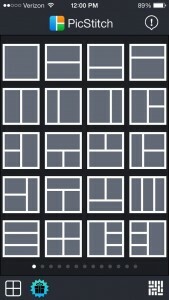 Tap the Aspect button, then pick a size, anything from square (1×1) to portrait (4×6). You can also drag the borders of your collage around by tapping Resize. Ready to share? Tap Export, then pick your favorite social network (Facebook, Twitter, Instagram, and so on). You can also send your collage as an email message, or save it to the iOS Photo Album. Got other iOS photo collage apps to recommend, or other tips to share? Let us know! Note: The makers of Pic Stitch haven’t compensated me in any way for this article.